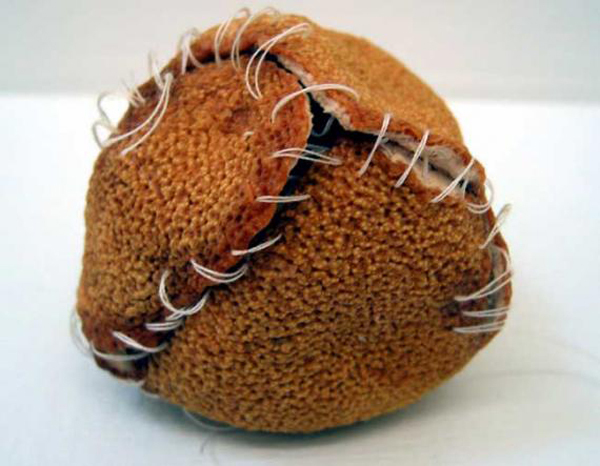 There is something sad and touching about emptied out fruit stitched back up in a futile attempt at mending. But there’s also something about it that amuses me in a way. I think in Zoe Leonard’s installation Strange Fruit (for David) the thing that both moves me and makes me smile is the scale of the thing. It feels like a point that could have been made with a few pieces has taken control and not let Leonard stop; the empty fruit are scattered liberally across the floor, filling the space. In total roughly three hundred pieces of fruit have had their peel or skin dried out and put back together with stitching or other forms of fixing or adornment. These are fruit that have been mended imperfectly – the stitches are large and loose, there is no attempt at trickery here, rather there is a feeling of urgency – but it’s clear care has been taken. 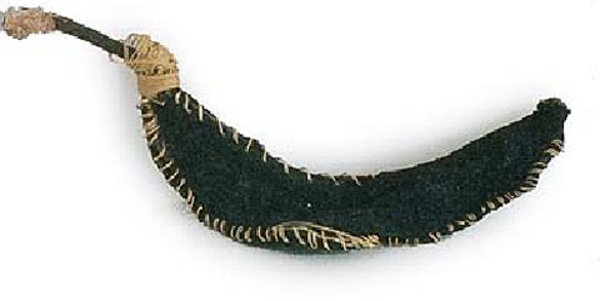 In some cases zips have been fitted to banana skins so that repair gives way to transformation but either way there is an attempt to give the fruit a new lease of life. This is a work whose title offers both a clue to its meaning and a wider cultural resonance. Strange Fruit is the title of a Billie Holiday song about racism and the American south, the David Leonard’s work memorialises is her friend David Wojnarowicz (who I wrote about here yesterday) whose own work spoke eloquently about discrimination. Zoe Leonard’s practice is wide-ranging but she is perhaps best known for photographic work and with a strange timeliness this post coincides with the opening of an exhibition of her work at Camden Arts Centre, for which she has turned one gallery into a camera obscura. It’d be nice to claim that I’d timed my post deliberately but the truth is altogether more shambolic. I’ll be going to see the exhibition though, that much I do know. 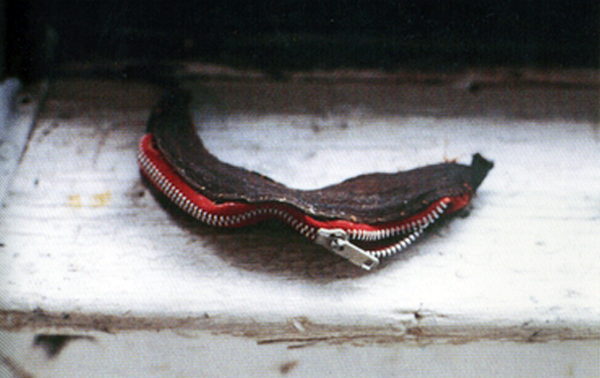 This entry was posted in Identity, Installation, Sculpture and tagged art, Billie Holiday, David Wojnarowicz, fruit, installation, photography, sculpture, stitch, Strange Fruit, Strange Fruit (for David), Zoe Loenard by Ann Jones. Bookmark the permalink.